Early November brought the 25th anniversary of the Fall of the Berlin Wall. 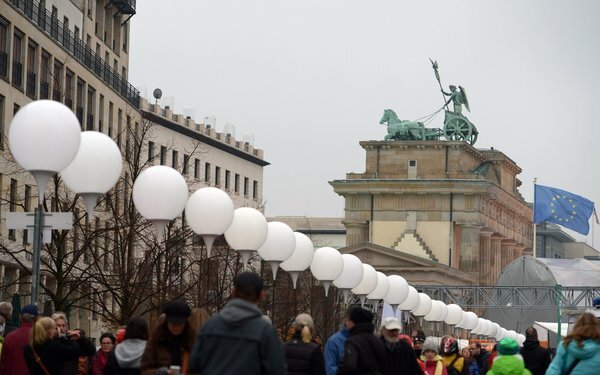 The city commemorated the historic event and changes it brought by placing 8,000 illuminated (and biodegradable) balloons along the city where the wall stood, designed by Christopher and Marc Bauder. The artists wanted the installation to be an “alien object,” like the Wall was, “something that doesn’t belong,” while also ensuring to evoke the hopeful feelings that came after the Fall. See their interview in this NY Times video. We think using illumination was a great way to achieve this. The artists made sure to use lighting in the balloons that was different from the surrounding exterior and building lights, achieving that alien effect. And the stark images of the lit installation in the dark definitely make one think of hope. It’s a common metaphor for a reason. Seeing that bit of light in the dark, either figuratively or literally, is a relief. In darkness, we often freeze. We can keep moving if we can see where we’re going, even just one step at a time. At the end of the three days, on the anniversary of the Fall, all 8,000 balloons (biodegradable, remember) were released into the air, symbolizing the hope that came with the Fall of the Wall, and the faith of the people that they can keep moving forward.